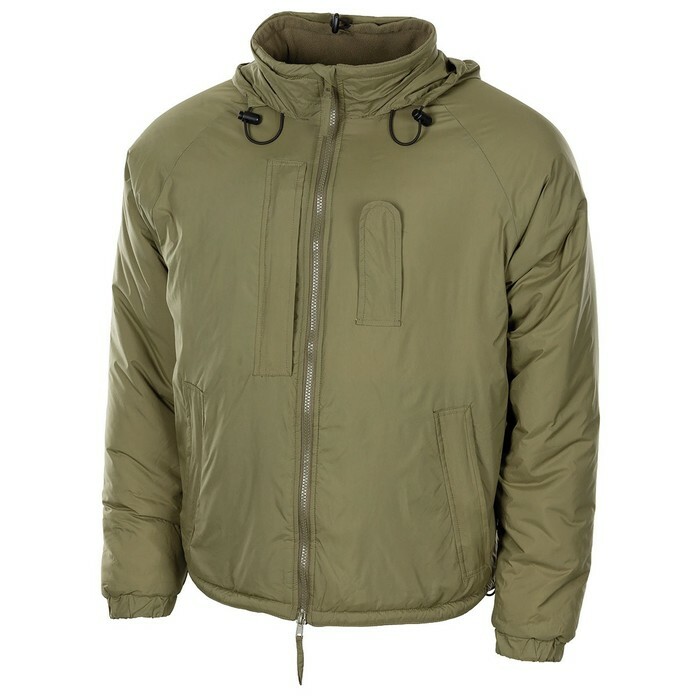 Latest PCS issue thermal cold weather jacket, designed to replace the aging reversible softee jacket on issue for many years. Made from lightweight ripstop nylon in light olive colour to match the other PCS clothing now on issue such as t shirts, fleece shirts etc on issue alongside. Fleece lined collar for added comfort, and foldaway hood concealed inside the collar, complete with wire stiffened peak for use in blizzard conditions. Chunky two way front zip, with velcro storm baffle and Velcro rank slide on the chest when worn as a top layer - also designed as a warmth layer underneath a goretex outer for example. Two large zipped front hand-warmer pockets. Lightweight polyester filling, designed to give maximum warmth for minimum weight. Large zip closure chest pocket on the right hand side of the chest, this has a reversible zip puller so the whole smock packs away into the chest pocket for easy packing away. Cord-lock adjustment to prevent heat loss at sides of jacket hem, and rear of collar. These are brand new, direct from the MoD contractor, still in poly wrappers, and come complete with all labels and NSN numbers etc.